If your business is involved in dealing with thousands of purchases a day, then you know how e-procurement applications can be heaven-sent and help you manage the often maze-like paper trail of endless supplier lists, product specs, pricing, and deliveries involved. While there are many various e-procurement platforms in the market, Tradogram is a very popular one with strong features and affordable pricing schemes. But is it a perfect solution for your needs? What are Tradogram pros and cons? In this article, we sifted through the strengths and weaknesses of this popular procurement software help you find out if it’s the right choice for your company. At a time when the supply chain is seeing an unprecedented level of change, digital procurement processes and systems that are based on them will have to keep pace with the abrupt transformations that go with those changes. Businesses will rely more on these solutions to meet the emerging challenges and keep up with the competition and new requirements imposed by the EU and other territories. This development comes in the heels of outstanding forecasts where cognitive analytics will be used in a third of all manufacturing value chains, thus, increasing cost efficiency by 10 percent and service performance by 5 percent by 2020. All that digital sea of changes will see industries in need to update how they handle, delegate, control and manage procurement and security, along with the way they traditionally look at supply chain planning and execution. The impact of these transformations will be felt for years. 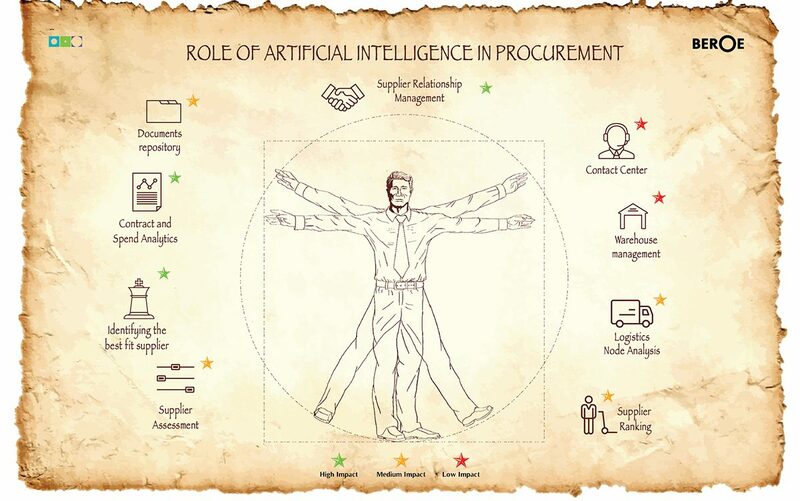 And as depicted in the illustration below, AI is smack right in the mix of things—from contact center, warehouse, to documents repository, even contract and spend analysis—as far as the future of e-procurement is concerned: in fact, IBM notes that the time is shortly coming when all important procurement decisions will come through the aid of artificial intelligence. While that does not mean employees getting on the bandwagon of data science, it does point to procurement workforce needing to tether best practices with the whole supply chain ecosystem. A brief background before we proceed with discussing the Tradogram pros and cons. For more than eight years now and running, Tradogram’s cloud-based spend management solution has been providing a strategic approach to purchasing for many class of industries. The platform ensures you get the best-value goods and services at the lowest prices possible. You use Tradogram to provide maximal advantages to your purchasing process, sourcing events, and supply chain management in order to achieve an optimal bottom line and spend visibility. With its novel approach to purchasing processes, Tradogram effectively redefines spend management. The innovative, powerful procurement software gives you access to a wide range of solutions to allow a successful spend control strategy in your company. Featuring all the essential capabilities that you should look for in an e-procurement system, Tradogram makes it easy to manage your spending and purchasing requirements. Its design is fully inspired by how real-world businesses go about their procurement processes, executed in their digital form and fully automated for your convenience. With a free basic offering and premium plan for just USD10, Tradogram is well positioned to be a partner rather than a burden to your business. You could use the free plan, which is good for one user and up to purchase orders per month, to determine whether the solution is a perfect match for your needs. There’s a responsive dashboard, an unlimited number of items, unlimited number of suppliers and an unlimited number of categories. It also comes with contract management, RFQ/RFP management, and delivery tracking system. Provision for one user could be a bit limiting if you want to get some useful output from the software, and you are most likely to bump into functionality limitations. For example, PO and invoices could be treated separately, something that is avoided in the paid versions. When you are ready to fully subscribe, the USD10 premium plan gives you all the basic functionalities along with an unlimited purchases orders and a minimum of two users. If your needs are along the enterprise level, you could contact Tradogram for a quote. The package already comes with a minimum of 20 to an unlimited number of users. Tradogram provides customer support via phone, including a toll-free number, live chat, email, along with training for your personnel who will be in charge of the software. Tradogram provides distinct databases at the company, branch, and department levels. You can choose to use Tradogram as a buyer, supplier, or both for maximum flexibility. Add your organization’s details and all delivery addresses. Create and update branches, individual users, approval routes, and user permissions. Create and edit budgets to control spending at all hierarchy levels of your company. Edit your Tradogram subscription and billing details. Add users and change plans. Authorize your team by approving new user requests and sales roles. Choose to completely white-label your account and supplier emails. Your company logo will appear instead of the Tradogram logo. Add branch details, select your currency, and pick your timezone. Add users and set unique user permissions. Control the actions that are permitted and denied for each user. Add departments to group users and assign a department manager. Choose the item categories that users in each department are authorized to access. Customize your own purchase order serial number. All numbers used and skipped are tracked. Administrators have the ability to set up an account and are able to access all features on the application. This enables them to oversee the progress of their user’s work, at all hierarchy levels of the company. Tasks can be delegated and activities can be monitored with ease. Put your managers in charge and strengthen your procurement process. User permissions can be used in tandem with approvals to help establish everyone’s role so they stick with them. Set custom parameters to indicate that certain purchases require approval. Customizing the actions of each user on the system by enabling and/or denying access to specific features. The ability to remove the visibility of features from a user’s account if they are denied certain permissions. Controlling filters to ensure that users are only able to view information that pertains to their role at the branch and company level. The option to select from a predetermined set of permissions. Customize your own hierarchy of approvals and choose which part of the company to apply the approval settings. Name primary and secondary users – secondary users are authorized to approve when primary users are unavailable. Alerts sent via email for quick and convenient approval. Set the type of approval based on product financial ($) amount and/or product category. Allow approvers to add notes for buyers to view. Approvals and user permission controls are important features for streamlining the actions of everyone connected to purchasing within your organization. Managers are able to effectively guide their teams to procurement success and prevent any unauthorized activity. While Tradogram stands for tighter control, you might not easily fall in love with lesser automatic functionality in this feature set. Keep pace with your organization’s purchasing patterns to spot opportunities and deviations. Use Tradogram’s intuitive dashboard to see your latest activity, your account statistics, and tasks that need your immediate attention. Track Requisitions – Enable requisitioners and purchasers to share notes and see the status of requisitions, from approval through to ordering and delivery. Track Requests – Buyers are notified in real time when suppliers open requests and when they send their bid offers. Track all changes made with color codes. Every step in a transaction is recorded and reported instantly. Track Purchase Orders – Obtain current PO status updates to see whether purchase orders have been approved by managers, or opened and accepted by suppliers. From initial creation right through to closing a purchase order, every step is recorded and tracked with an automated status update. Track Contracts – Get instantly notified about any updates on contracts. Track edits, renewals, and all orders made from each contract, giving you full visibility. Track Deliveries – Update delivery book-ins with notes on any discrepancies. Instantly share this information with your accounts payable team to make three-way matches with invoices received. You always know what’s happening with Tradogram’s automatic updates. Fully detailed reports are made available on all forms listed above for easy audits. If you want to develop a comprehensive understanding of your procurement process, Tradogram’s real-time analytics are designed to keep you informed. You’re able to see precisely what’s happening throughout every transaction—giving you the insight to optimize opportunities and improve savings. Quickly build your approved list of suppliers. Tradogram enables you to create and manage your own supplier database. You can search your approved vendors to find ideal trading partners and communicate with them easily & effectively. The ability to access current and comprehensive details about your suppliers is the first step to making smart purchasing decisions. Tradogram also includes simple yet practical supplier evaluations after each transaction, which you can use to compare your suppliers. This allows you to focus on working with those who provide the best value. Store critical supplier information such as item catalogs, financial data, contact details, performance history, transactions, contracts, etc. The supplier database is searchable in a variety of formats for simple management. You can choose to activate or deactivate suppliers as required. Communicate with suppliers through secure web links that are sent via email. You can choose to invite your suppliers to create a free Tradogram account and access the supplier portal. Complete short supplier scorecards to track vendor quality and maintain relationships with your preferred suppliers. Record and keep track of poor quality items, late deliveries, and inadequate documentation on every order. Control spend, save time, and collaborate with your internal clientele. Tradogram’s requisitioning system makes it easy for procurement teams to receive, understand, and fulfill the needs of everyone in your company. The smoother your requisitioning process, the faster it is for everyone involved—from the person submitting the requisition to buyers, approval managers, suppliers, and accounts payable. With Tradogram, requisitioning is efficient yet controlled, informed by your established approval processes and workflow procedures. Select Your Sources – Purchase goods and services from your items database, supplier contracts, OR from external sources such as websites and catalogs. Find What You Need Quickly – Use the smart search field to filter through your items database to find a desired item. The system will start searching as you type. Keep Everyone Informed – Add a due date to track when you expect the order to arrive. Add and share notes with the buyer. Track who’s approving and the status of each item from when it’s ordered to delivery. Combine and Save – Tradogram recognizes situations in which multiple buyers requisition the same item. You can combine items in a single purchase, improve economy of scale, and save! Search Requisition Details – Use the smart search tool to find specific requisitions. Buyers can review all requisitions—pending, open, & closed—including item details, dates, and the status of every item. Apply Authorizations – Authorize department managers to approve requisitions quickly and easily via email notifications. Approve and reject each individual item for greater flexibility and insight. Control Your Requisitions – When you can quickly identify your sources and your products, you save time. When you keep everyone informed, you work with intelligence. When you enforce your approval workflow, you maintain efficiency. Tradogram’s requisitions feature makes your procurement system fast and cost-effective. The Requests feature used for negotiations enables buyers, managers, and others in the procurement process to indicate precisely what they need, where, and when before deciding from whom. Tradogram gives you and your vendors the ability to exchange information quickly, so you can source the goods and services you need without delay. Tradogram’s Request form can be used as both an RFQ (Request For Quote) or an RFP (Request For Proposal). Add product descriptions straight from your items database or include new information from a requisition. Drag-and-drop file attachments to ensure that every transaction has all the required documentation to share with suppliers. Send your requests to your approved vendors via email to get their offers and bids in a simple, easy-to-compare format. Track the status of every Request and each supplier’s response, with alerts and email notifications. Resend and clone requests easily. Choose a sealed bidding option, to lock in offers with a start and end date. Convert currencies and units of measure for simplified comparisons. Enable multiple users in different locations to review and evaluate offers together to make quick, collaborative decisions. Adjust settings to indicate which parts of a request your suppliers are authorized to edit. On every offer, all edited fields are highlighted to help you identify the changes. Use Tradogram’s advanced comparison tools to help you in the evaluation process. Close with multiple suppliers by creating multiple purchase orders from a single Request. Using Requests, you can easily send your custom POs to your suppliers track them at every stage. A purchase order management system can help you track and recognize trends in your purchasing activity. Purchase Orders at a Click – Quickly and automatically create and send purchase orders. Existing POs can be duplicated for easy reordering. POs can also be closed and reopened at your convenience. No Extra Typing Required – Purchase orders are auto-filled. File attachments can be dragged-and-dropped for your convenience. Multiple Deliveries Option – POs on Tradogram are flexible enough to give you an option to track multiple deliveries to numerous locations easily and with precision. Enforceable Approval System – Tradogram automatically recognizes any approval workflows that have been established. POs that fall under certain parameters are automatically routed to the appropriate approvers. Automatic Alerts – Receive alerts in your Tradogram account and notifications through email for every status update. Whether you requested confirmation from your supplier or you’re waiting for an approval, instant alerts will keep you informed. Review Your Transactions – For your records, our system automatically creates a comprehensive report of every transaction from start to finish, giving you a detailed view of each order and all its stages. Access Information in PDF Format – Purchase orders are accessible in two versions: a digital version and a downloadable PDF. Easily share your POs with your suppliers without clunky attachments. Customize Your Purchase Orders – Add your logo, customize certain fields, pick your own serial numbering system, and enter a standardized terms & conditions footer. It’s hard to find fault in a solution that delivers excellently in the three fronts that truly matter: feature sets and practical usability, very reasonable, even budget-friendly pricing, and customer support that gets the nod of multiple users who had to actually deal with the vendor’s help desk. However, if you’re a Tradogram user and there’s something about the software that you feel could be improved, we’d love to hear from you through our comments section. Superior, comprehensive features, excellent price propositions, and stellar support make this unique software a compelling solution to your business procurement and spend management needs. And the free basic plan should give you all the time and testing you need to determine how much of a fit the system is to your business.